Note: If you began your undergraduate degree before Fall 2018, consult the previous General Education curriculum for requirements. 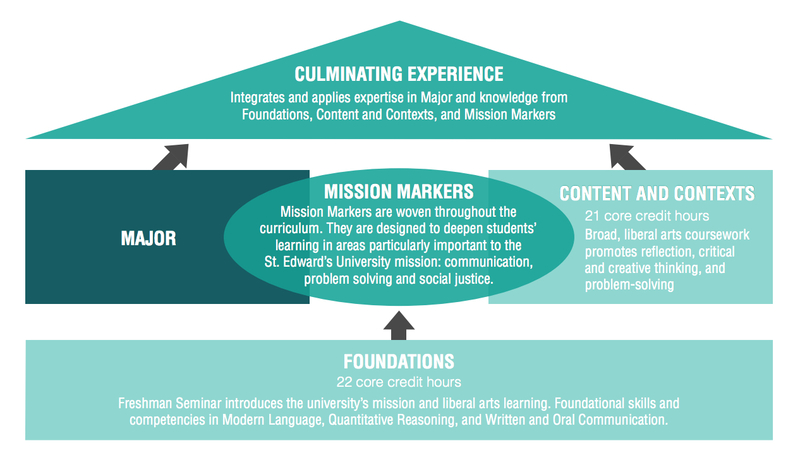 Reflecting the St. Edward's University Mission, the core curriculum consists of four key components designed to develop in students a broad knowledge base and set of skills that allow them to succeed in their vocations: Foundations, Content and Contexts, flagged Mission Markers, and a Culminating Experience. Courses that develop foundational skills and knowledge comprise 22 credit hours; the other 21 Content and Contexts hours build on this foundation. Every student completes a culminating experience course approved by their major. Students are invited to pursue minors or double majors as interdisciplinary complements to their major work. 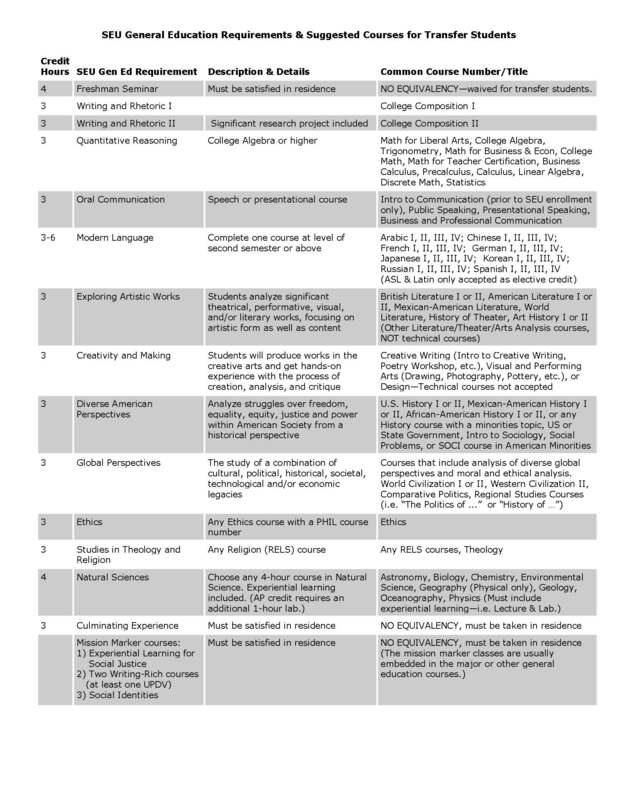 The Suggested SEU Core Sequence provides guidance for students and advisors as to the sequencing of specific general education requirements recommended for most students; however, students may want to adapt this sequence according to their own particular needs. Below is an overview of the various components of the SEU core curriculum. The SEU Core Curriculum Overview also provides short descriptions of each general education requirement. The university welcomes first-year students each fall with a Freshman Seminar in which students join a community of learners and actively engage in academic and co-curricular exploration. As they are introduced to our campus life and mission, they will also develop critical thinking skills necessary to become successful students and lifelong learners by meaningfully confronting questions of social justice. Students generally complete Foundations courses in their first year and complete Content and Contexts coursework in the second and third years. Students may also elect to take general education courses as part of a study abroad program. Throughout their academic career, students will be given the opportunity to engage with the university’s mission by choosing four Mission Marker courses in the major or core curricula to further develop their writing; to better understand issues related to social identities, diversity, and equity; and to broaden their understanding of social problems and participate in community-based activities that address these issues. Mission marker requirements will usually be fulfilled by courses in the major or courses that fulfill other general education requirements and thus add no additional hours to the student's curriculum. Mission Markers are expected to be taken in residence, and only SEU courses are flagged as meeting Mission Markers. However, students can petition to have a transfer course count as a Mission Marker. Before graduating, students will complete a Culminating Experience project through coursework in the major or school that demonstrates the depth of learning in the major and is facilitated by the skills and enriched by the contexts explored in their course curriculum. The Culminating Experience is a senior-level course or series of courses in the major that involves a substantial, discipline-appropriate project. The Culminating Experience course demonstrates and integrates key learning outcomes in the major discipline and general education curriculum, encompassing the student’s entire career at St. Edward’s University. The Culminating Experience is a senior-level course or series of courses in the major or the department that must include a substantial, discipline-appropriate project or creative work. The Culminating Experience course demonstrates and integrates key learning outcomes in the major discipline and general education curriculum, encompassing the student’s entire career at St. Edward’s. The Student Learning Outcomes for all general education classes can be found here. All of the courses listed under a general education requirement will fulfill the requirement. Not all of the listed courses will be offered in any given semester. Topics vary by semester. Transfer students will not take the first-year seminar. Current students transitioning to the new general education have already fulfilled this requirement with their FSTY course. The policy for fulfilling foreign language requirements has not changed under the new general education curriculum. Students can still fulfill their Modern Language requirements in a variety of ways outlined in the Bulletin. Note that only the three credit-hour courses listed below will fulfill the natural sciences requirement. These courses involve substantial experiential learning that substitutes for a lab course. Otherwise, any science with its accompanying lab will fulfill the requirement. **No course fulfilling the DAP requirement can also fulfill the Social Identities Mission Marker. A course may only be approved to fulfill one of these two general education requirements. 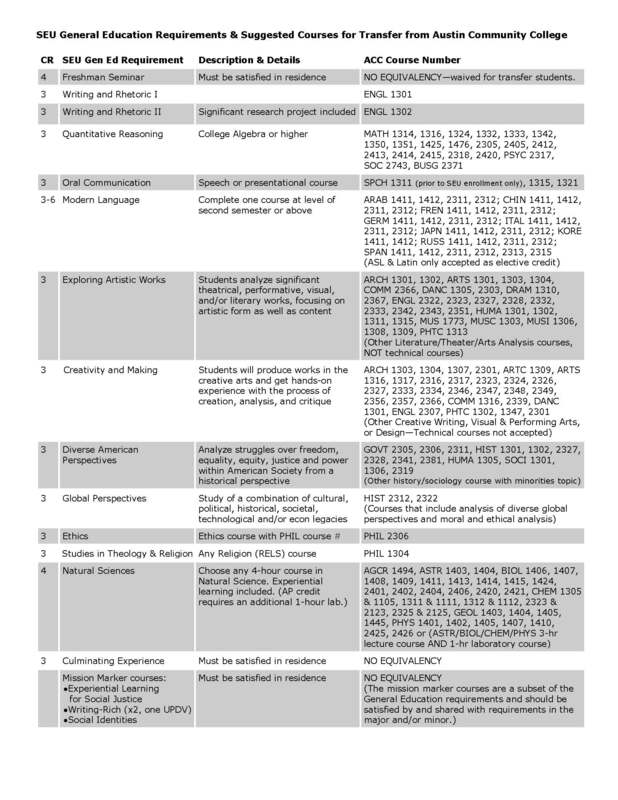 Mission Markers are flagged elements within existing courses for the core or major, not additional required courses. The Mission Markers focus on Writing (2 flags), Social Identities, and Experiential Learning for Social Justice. They are designed to deepen students’ learning in areas particularly important to the SEU mission: communication, problem solving, diversity, and social justice. Mission Markers are expected to be taken in residence, and only SEU courses are flagged as meeting Mission Markers. However, students can petition to have a transfer course count as a Mission Marker. **Mission Markers apply to all sections of a course unless a particular instructor is named in ( ). Topics courses, which vary by semester and instructor, are likely to be approved only for certain instructors. ##In some cases, students may petition to have alternative courses or substantive co-curricular experiences substitute for a mission marker course. **No course fulfilling the Social ldentities mission marker requirement can also fulfill the Diverse American Perspectives requirement. A course may only be approved to fulfill one of these two general education requirements. **First-year seminars cannot fulflill the Experiential Learning for Social Justice mission marker. **One writing rich mission marker must be upper-division. Culminating Experience courses are courses in the major although we anticipate that some Schools may develop culminating experience courses that will fulfill this requirement outside of the major. For students graduating prior to FA19 who must complete the Culminating Experience in order to graduate, CAPS 4360 will be required as a substitution for any major in which a Culminating Experience course is unavailable. 1.Will students automatically be enrolled in the new general education curriculum? Only those students who enroll for the first time in FA18 or after will be automatically required to fulfill the new general education curriculum. Continuing students may find it beneficial to switch to the new curriculum. Students who wish to switch to the new curriculum need to fill out the New General Education Change Request form from MyHilltop. 2. When can students declare that they want to switch to the new general education curriculum? Students can notify their School of their desire to change to the new general education curriculum beginning March 1, 2018. Degree Works will allow students to try “what if” options with the new general education curriculum. Students should evaluate their options and make their decisions as part of their academic advising for FA18. Please note that when students try the “what if” under the 2018-2019 bulletin for general education, Degree Works will act as if they have changed bulletins for their major as well. But see #3 below: Students will be able to change to the new general education curriculum without changing the bulletin for their major. 3. Can students change to the new general education curriculum without changing the bulletin they declare for their major? Students may switch to the new general education curriculum without switching to a new bulletin for their major. 4. Once students transition to the new general education curriculum, can they change their minds again and go back to the older version? No, they really cannot change back and forth. In fact, because the new curriculum is significantly smaller than the old one, we can’t see how switching back again to the larger required curriculum would benefit a student. Also, all of the CULF courses will count towards the new curriculum, but it will be harder to use new courses to fulfill the old curriculum if a student changes back again. 5. How will I know which courses count for the new requirements? 6. Can courses double count, as courses required for a major and general education? Yes. Degree Works will show where a single course can fulfill both requirements. 7. What will happen to the CULF and CAPS courses? We will continue to teach them for several semesters until students under the old general education plan have fulfilled their requirements. 8. Do students finishing SEU under the old general education curriculum need to enroll in Capstone? Students in the new curriculum will complete a Culminating Experience in their major instead of Capstone, but students graduating under the old curriculum must complete CAPS. We will continue to offer CAPS courses in the regular semesters and summer for a few years. 9. Do non-science majors have to take a lab science to fulfill their general education requirements? No. There will be some three credit-hours courses in a variety of natural sciences that will allow non-science students to fulfill the experiential learning component required by general education without taking a separate lab course. Any science course that is accompanied by a corresponding lab course will also fulfill the general education requirements. 10. Do students still have to earn a C or higher in the courses they take to fulfill the Quantitative Reasoning and Writing I and II requirements?